The Dave Nee Foundation’s innovative and unique program, Uncommon Counsel, fights depression and works to prevent suicide among law students. Uncommon Counsel educates law students about depression, its prevalence in the legal profession, and the availability and effectiveness of treatment. Watch this short video with select feedback from faculty and students who have attended an Uncommon Counsel presentation. Why is Uncommon Counsel Important? Nobody talks about depression and mental health issues – especially lawyers. Attorneys have the highest rates of depression and suicide of any profession and 40% of law students in their third year of school report experiencing symptoms of depression. Further, lawyers are 3.6 times more likely than any other occupational group to suffer from depression. Statistics demonstrate that the rate of suicide attempts among attorneys is increasing as the effects of the economic downturn of the past few years continue to spread. It is urgent that law students and attorneys who exhibit the warning signs for suicide get the help they need. Our goal is to have Uncommon Counsel present in all major law schools around the country. We believe this important program will save lives. In the academic year 2013-2014, the Dave Nee Foundation made 41 Uncommon Counsel presentations at 35 law schools throughout the United States. 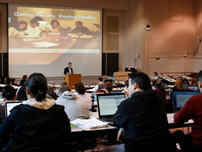 While the presentation format was tailored specifically to each law school, the goals of the presentations were universal. In each presentation, we sought to raise awareness about the prevalence of depression, anxiety, and suicide within the legal community and to equip law students with the skills and the resources to assist them with mental health concerns throughout their legal careers. Attendees of the majority of our presentations were asked to complete a feedback form. The responses from the feedback forms are included below. The data below represents responses from 1,014 attendees from 32 law schools. Typically, the number of attendees is higher than the number of attendees who complete feedback forms. We calculated an overall response rate of approximately 72 percent. Our audience size varied from two to 250. To learn more about the scholarship and researching influencing Uncommon Counsel, please click here. 97.1% of those surveyed reported that the information provided through Uncommon Counsel will help them to recognize the symptoms of depression. 95.1% of those surveyed reported that as a result of an Uncommon Counsel presentation, they can now identify 3 warning signs of suicide. 92.5% of those surveyed reported that as a result of an Uncommon Counsel presentation, they knew at least 3 places where they could get help for depression, anxiety and other mental health concerns. Interested in hosting an Uncommon Counsel presentation? We will work with administrators, faculty, student groups and lawyers assistance program leaders to create a program that meets the needs of your school. Whichever format is agreed upon, we intend to impart three important messages to students. 1. If they are feeling depressed or anxious, they are not alone. 2. There is no shame in seeking help or asking a friend if he or she needs help. 3. Help is available at school and in the community. Interested in volunteering and leading an Uncommon Counsel session? We are seeking attorneys throughout the country who are interested in leading Uncommon Counsel educational programs in the law school and bar association community of interest to them. This is a wonderful opportunity to present a program that has been developed and in use since 2012. With technical support and training offered by Katherine Bender, PhD, our Programming Director, you will join the ranks of other like-minded attorneys intent on giving back and raising awareness about mental health challenges facing law students. Please contact Kate at kbender@daveneefoundation.org for more information about how you can make a difference with law students. The Foundation thanks its supporters for helping to bring Uncommon Counsel to law schools and legal associations around the country. Thank you to Mr. Davidson T. Gordon, Mr. & Mrs. Amit Shashank, and Mr. & Mrs. John W. Van Dyke for helping Uncommon Counsel reach the Midwest. Thank you to Elizabeth J. Kanter and Gerry, Rosie & Brian Reidy for helping Uncommon Counsel reach the South. Thank you to Mr. & Mrs. Richard Vermillion for helping Uncommon Counsel reach Texas. Thank you to Mr. & Mrs. Owen Nee for helping Uncommon Counsel reach the West Coast.